Imagine going to see Aquaman at a special fan screening, and then having the underwater superhero show up in the flesh. That is exactly what happened this weekend at a sneak peek of the DC adventure, which is in theaters starting December 21. Last Night, Jason Momoa stopped by Time Square before surprising everyone who had settled into see an advanced screening of Aquaman. 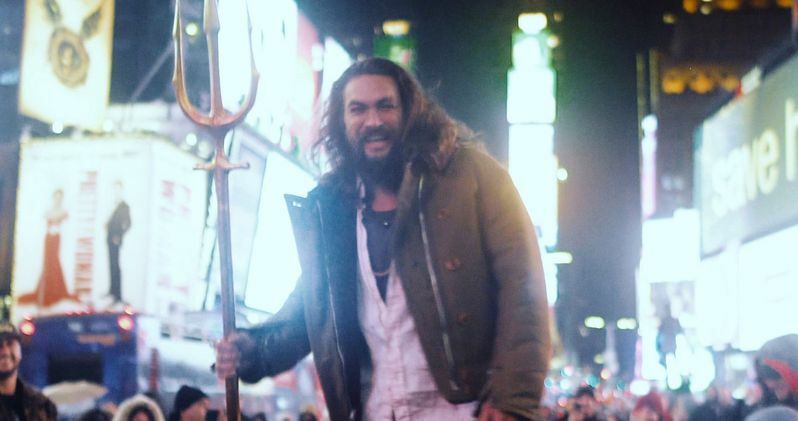 Photos show Jason Momoa standing in the heart of Times Square, wielding his soon-to-be-iconic Trident in front of unexacting crowds. This is Times Square in New York, however, so the locals are no strangers to strange goings on in the City. Though some were quite taken aback by the DC superhero's sudden appearance in the street. Jason Momoa was later greeted by the cast and crew of director James Wan's underwater epic inside the theater. Momoa and Wan reunited, along with stars Willem Dafoe, Amber Heard, and Patrick Wilson. The screening is said to have been a huge success. And it looks like DC and Warner Bros. could have a bigger hit than Wonder Woman on their hands. From Warner Bros. Pictures and director James Wan comes an action-packed adventure that spans the vast, visually breathtaking underwater world of the seven seas, Aquaman starring Jason Momoa in the title role. The film reveals the origin story of half-human, half-Atlantean Arthur Curry and takes him on the journey of his lifetime, one that will not only force him to face who he really is, but to discover if he is worthy of who he was born to be...a king. Wan directs from a screenplay by David Leslie Johnson-McGoldrick (The Conjuring 2) and Will Beall (Gangster Squad, TV's Training Day), story by Geoff Johns & James Wan and Will Beall, based on characters created by Paul Norris and Mort Weisinger for DC. The film is produced by Peter Safran and Rob Cowan, with Deborah Snyder, Zack Snyder, Jon Berg, Geoff Johns and Walter Hamada serving as executive producers. Wan's team behind the scenes includes such frequent collaborators as Oscar-nominated director of photography Don Burgess (The Conjuring 2, Forrest Gump), his five-time editor Kirk Morri (The Conjuring"films, Furious 7, the Insidious films), and production designer Bill Brzeski (Furious 7). They are joined by costume designer Kym Barrett (The Matrix trilogy, The Amazing Spider-Man) and composer Rupert Gregson-Williams (Wonder Woman). Warner Bros. Pictures Presents a Peter Safran Production, a James Wan Film, Aquaman. The film is set to hit theaters on December 21, 2018, in 3D and 2D and IMAX, and will be distributed worldwide by Warner Bros. Pictures. Aquaman is rated PG-13 for sequences of sci-fi violence and action, and for some language. You can check out official photos of Jason Momoa and his team infiltrating the screening in Times Square, where the were accompanied by several folks who saw in direct from Atlanta. These images come direct from Warner Bros..